This article introduces the features that are available in the technical preview for Configuration Manager, version 1901. Install this version to update and add new features to your technical preview site. 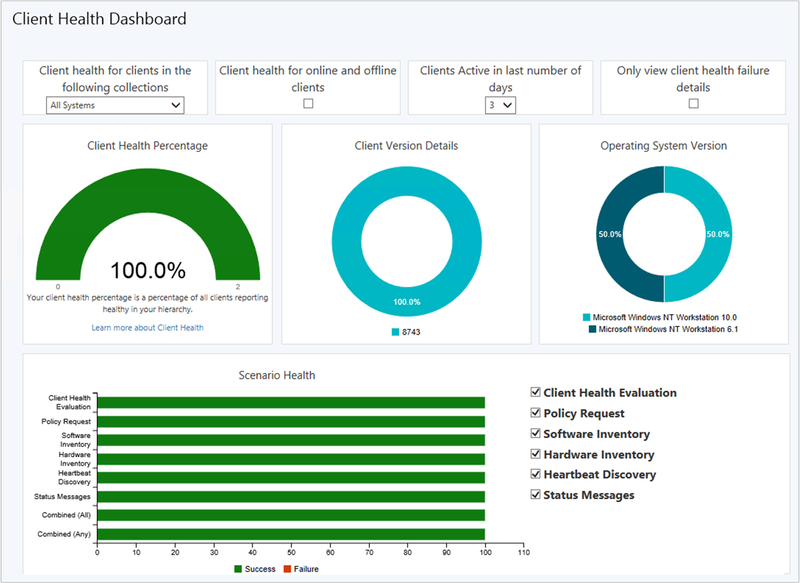 You can now view a dashboard with information about the health of Configuration Manager clients in your environment. View your client health, scenario health, and common errors. Filter the view by several attributes to see any potential issues by OS and client versions. In the Configuration Manager console, go to the Monitoring workspace. Expand Client status, and select the Client health dashboard node. There are no changes to ccmeval in this version. At the top of the dashboard, there's a set of filters to adjust the data displayed in the dashboard. Collection: By default, the dashboard displays devices in the All Systems collection. Select a device collection from the list to scope the view to a subset of devices in a specific collection. Online/offline: By default, the dashboard displays only online clients. This state comes from the client notification channel that update a client's status every five minutes. For more information, see About client status. Active # days: By default, the dashboard displays clients that are active in the last three days. Failure only: Scope the view to only devices that are reporting a client health failure. Use this filter along with the client version and OS version tiles. For more information, see Version tiles. For more information, see About client status. A healthy client successfully communicates with the site. It reports all data based on the defined schedules in client settings. Select a segment of this chart to drill down to a device list view. There are two tiles that show client health by Configuration Manager client version and OS version. These tiles are useful when you make changes to the filters, such as Failure only. They can help highlight whether any issues are consistent across a specific version. Use this information to help you make upgrade decisions. Select a segment of these charts to drill down to a device list view. Use the selectors to adjust the focus on specific scenarios in the chart. In the Configuration Manager console, go to the Monitoring workspace, and select the Client Status node. In the ribbon, select Client Status Settings. By default, if a client doesn't send scenario-specific data in 7 days, Configuration Manager considers it unhealthy for that scenario. This chart lists the most common failures in your environment. These errors come from Windows or Configuration Manager. Normal: Windows Setup uses more system resources and updates faster. It uses more processor time, so the total installation time is shorter, but the user's outage is longer. This value is the default. Low: You can continue to work on the device while it downloads and updates in the background. The total installation time is longer, but the user's outage is shorter. This setting has no impact on Windows 10 in-place upgrade task sequences. This setting applies when upgrading to Windows 10, version 1709 or later. Configure client settings. For more information, see How to configure client settings. In the Software Updates group, configure the following setting: Specify thread priority for feature updates. Deploy a Windows 10 feature update using a servicing plan. For more information, see Windows 10 servicing plan. Select the Phased Deployments node. It shows the list of phased deployments. Select one of the phased deployments, and then choose View phased deployment status in the ribbon. This option can't be used with this release due to the technical preview limit of a single primary site. The primary site still handles the communication to the client. When running CMPivot from the central administration site, it communicates with the primary site over the high-speed message subscription channel. This communication doesn't rely upon standard SQL replication between sites. For more general information, see CMPivot for real-time data. You could previously run scripts from a central administration site. With this improvement, scripts also use the high-speed message subscription channel. The primary site quickly receives the message and notifies the client to run the script. This behavior reduces the time delay for running a script on a client from the central administration site. For more general information on scripts, see Create and run PowerShell scripts from the Configuration Manager console. Specify alternate user credentials with the option to Run this step as the following account. Specify a Time-out (minutes). This option ends the step if the script runs past the timeout value. On the Options tab, specify Success codes. Include other exit codes from the script that the step should evaluate as success. For more information on this dashboard, see Use the Product Lifecycle dashboard. Go to the Assets and Compliance workspace, and select the Devices node. You can also view the membership of a Device Collection. When you view a list of devices, add the MAC Address column to the view. Use the search field to add the MAC Address search criteria. You can now set a distribution point in maintenance mode. Enable maintenance mode when you're installing software updates, or making hardware changes to the server. The site doesn't distribute any content to it. Management points don't return the location of this distribution point to clients. The distribution point properties are read-only. For example, you can't change the certificate or add boundary groups. Be careful about enabling maintenance mode on more than one distribution point. This action may cause a performance impact to your other distribution points. Depending upon your boundary group configurations, clients may have increased download times or be unable to download content. Select the Distribution Points node. Select the target distribution point, and choose Enable maintenance mode from the ribbon. To view the current state of the distribution points, add the "Maintenance mode" column to the Distribution Points node in the console. You can use the SetDPMaintenanceMode WMI method in the SMS_DistributionPointInfo class to automate this action. For more information, see SMS_DistributionPointInfo Server WMI Class. Description: Source distribution point NAL path. An uint32 data type that's 0 indicates success. A non-zero hresult indicates failure. When you apply software updates to an OS image, there's a new option to optimize the output by removing any superseded updates. The optimization to offline servicing only applies to images with a single index. This feature is based on your UserVoice feedback. Run DISM against the mounted offline image with the parameters /Cleanup-Image /StartComponentCleanup /ResetBase. If this command fails, the current servicing process fails. It doesn't commit any changes to the image. After Configuration Manager commits changes to the image and unmounts it from the file system, it exports the image to another file. This step uses the DISM parameter /Export-Image. It removes unneeded files from the image, which reduces the size. Microsoft recommends that you regularly apply updates to your offline images. You don't have to use this option every time you service an image. When you do this process each month, this new option provides you the greatest advantage by using it over time. While this option helps reduce the overall size of the serviced image, it does take longer to complete the process. Use the wizard to schedule servicing during convenient times. It also requires additional storage on the site server. You can customize the site to use location an alternate location. For more information, see Specify the drive for offline OS image servicing. For more general information about offline servicing, see Apply software updates to an image. On the Set Schedule page, select the option to Remove superseded updates after the image is updated. This option isn't automatically enabled. If the image has more than one index, you can't use this option. To schedule image servicing, complete the wizard. Validate and monitor the process using the OfflineServicing.log. On the Data Source page, select the option to Extract a specific image index from the specified WIM file. Then select the image index from the list. Configuration Manager doesn't modify the source image file. It creates a new image file in the same source directory. Existing deployments continue to work. Starting in this technical preview branch version, Azure Resource Manager is the only deployment mechanism for new instances of the cloud management gateway and cloud distribution point. To copy the feedback ID, select the copy icon next to the feedback ID, or use the CTRL + C key shortcut. This ID isn't stored on your computer, so make sure to copy it before closing the window. For more information, see Create a Configuration Manager technical preview lab in Azure. You can now specify a custom port number for wake-up proxy. For more general information, see New client notification action to wake up device. Wake On LAN port number (UDP): By default, this setting is UDP port 9. Change it as necessary for your network environment. Expand Security and select the Console Connections node. You'll always see your current console connection in the list. It only shows connections from the Configuration Manager console, not PowerShell or other SDK-based connections to the SMS Provider. The site removes instances from the list that are older than 30 days. When you view this node, the Configuration Manager console may stop working correctly. On the properties of the SMS Provider site role, disable the option to Allow Configuration Manager cloud management gateway traffic for administration service. Even if the service isn't running, there are still costs associated with the cloud service. Stopping the service doesn't eliminate all associated Azure costs. To remove all cost for the cloud service, remove the CMG. When the CMG service is stopped, internet-based clients can't communicate with Configuration Manager. For more information on these data flows, see CMG ports and data flow. The storage alert threshold is separate. That alert monitors the capacity of your Azure storage instance. When you select the CMG instance in the Cloud Management Gateway node in the console, you can see the total data transfer in the details pane. Configuration Manager checks the threshold value every six minutes. If there's a sudden spike in usage, Configuration Manager can take up to six minutes to detect it exceeded the threshold and stop the service. Enable the option to Stop this service when it exceeds the critical threshold. 14-day threshold for outbound data transfer (GB). The default value is 10000. Percentage of threshold for raising Critical alert. The default value is 90. During an OS deployment task sequence, Configuration Manager places the client in provisioning mode. In this state, the client doesn't process policy from the site. This behavior allows the task sequence to run without risk of additional deployments running on the client. When the task sequence completes, either success or handled failure, it exits client provisioning mode. If the task sequence unexpectedly fails, the client can be left in provisioning mode. For example, if the device restarts in the middle of task sequence processing, and it's unable to recover. An administrator must manually identify and fix clients in this state. Now the task sequence sets a timestamp when it puts the client in provisioning mode. A client in provisioning mode checks every 60 minutes the duration of time since the timestamp. If it's been in provisioning mode for more than 48 hours, the client automatically exits provisioning mode and restarts its process. 48 hours is the default provisioning mode timeout value. You can adjust this timer on a device by setting the ProvisioningMaxMinutes value in the following registry key: HKLM\Software\Microsoft\CCM\CcmExec. If this value doesn't exist or is 0, the client uses the default 48 hours. Based on your UserVoice feedback, there's a new View action on task sequences.